Assuming you have read the previous article Your First Garden, there are a few more things you need to know about starting a garden for fruits and vegetables. Selecting plants for food requires a bit more thought than selecting beautiful flowers. You need to know more about the plants and what they require. For my first vegetable garden I decided to plant the things I love most and that are very expensive at the grocery store. Fresh garden tomatoes are my favorite, so very much more flavorful than at the grocery store. And we eat a lot of peppers, one green pepper at the store can cost nearly as much as a plant that will produce 8 or 12 perfectly fresh ones. Start small to ensure success. In your first season you will learn to care for your plants properly. It can be overwhelming to keep up with a large garden that needs to be watered, fed, and weeded at the same time that you are trying to learn about the specific plant maintenance. Start with highly productive plants. It is encouraging to grow a tomato plant that produces dozens of tomatoes rather than broccoli or corn, which takes a fair amount of space and does not produce much. Of course if you adore broccoli, by all means learn to grow it. But you may not want to start with the low producers right away. Pick your spot. The more sun the better. I find that 6 hours is not adequate for most vegetables. 8 to 10 hours is much better and sun up to sun down is ideal. 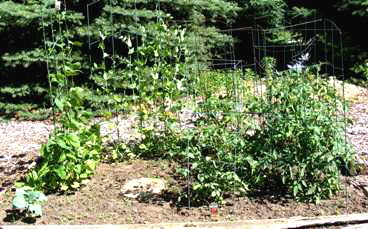 The herbs and lettuce that don’t want so much sun can be planted behind tomatoes so they get some shade in the heat of the day. As noted in the previous article, growing food requires very fertile soil. There are many methods of preparing a bed that you can read about Gardening Methods, where you will also find my opinions of the methods. My preferred method for quick starting a garden bed is to dig deeply and enrich the soil so your very first crop is assured adequate nutrients. The most important thing to do when preparing the soil is to remove all sod and weeds then loosen the soil very deep. Dig down as deep as you can, throw the dirt alongside the hole, then dig again to loosen the soil as deeply as possible. Shovel the soil back in that you piled up. Improve the soil texture and fertility. During the double digging process, add lots of soil conditioners and organic amendments so that it is available deep in the soil for your plant roots. Add lots of peat or dry well shredded leaves, compost and manure (composted). You should be adding enough matter to equal at least 3 or 4 inches deep across the entire bed and dig it in deeply. In future years, much of the work will be done by insects, worms and microorganisms, who will pull the nutrients that you add to the surface deep into the soil. Planting container grown produce is simple, just a few tips will get you going. You can plant your garden in rows but you do not have to. It is more helpful to think about easy access to each plant for weeding, feeding, pruning and harvesting. If nice straight rows accommodates your space best it will also help with access. But perhaps a circle or semi circle will work better. Dig a hole with a trowel (a small hand held “shovel”) a little deeper and wider than the container. If the roots have heavily filled and circled the container, you should gently loosen the roots before planting and spread them out a bit in the hole. Most plants are tougher than you think, I often just grasp the root ball with both hands and break apart the roots. I think they have a much easier time just growing more roots than trying to break out of a dense ball themselves. Push the soil back into the hole around the plant and gently press the soil lightly. It is better to plant a little too deep than too shallow. As you experiment with more plants you will find a few plants that are very particular about how deep they get planted. For example plant a tomato all the way up to the first big set of leaves, but strawberries need to have its crown barely above the soil surface. Keep your produce clean by spreading a little mulch or straw around each plant. At 1 or 2 inches deep the mulch will also help reduce weeds. Every plant will need to be watered deeply and frequently while the roots establish. Deep soak right after planting then water daily for several days. The soil should be kept moist several inches deep for at least a couple of weeks. Then you can reduce watering to a regular schedule according to the needs of the plant. After the first two or three weeks, be careful not to over water! The roots will “drown”, and be able take in air and nutrients essential to growth. This is a difficult subject, there are so very many viewpoints on how and what to feed your vegetable garden. And what you feed them with, as well as the nutrients in your soil, will determine how often to feed them. Since I have already warned you that there is a little bit more to starting your first vegetable garden than starting a flower garden, I will suggest further reading as we go. A simple, inexpensive soil test kit will tell you which nutrients are deficient in your soil. The primary nutrients are N (nitrogen), P (phosphorus) and K (potassium). By testing your soil you will know which nutrients may need a little boost. A general purpose vegetable garden fertilizer may have an NPK of 5-5-5. But perhaps your soil needs 10-20-10. Or perhaps all you need is some nitrogen. If you have not tested your soil, stick with a 5-5-5. Your plants will give you signs if there is a deficiency. (Yes, you will also need to learn about signals from your plants!) Slow release granular fertilizers generally only need to be applied once. Organic fertilizers are better for your plants. Just like you are what you eat, they are what they eat also. If you feed chemicals to your plants, you in turn will be eating chemicals. (OK, I admit I use them on occasion.) You can learn more about fertilizers: All About Fertilizers. Even better, you can use natural organic amendments. Nitrogen is added to your soil with composted manure, but you can also add blood meal if your soil is nitrogen deficient. The Soil Amendments article lists many natural sources for nutrients as well as the corresponding N-P-K ratios. If you are growing vegetables and fruits you should expect to save money as well as produce fresh delicious food. I am astounded when I see statements like “It takes a lot of equipment to start a vegetable garden”. I have been gardening for more years than I will tell with only very basic tools. I will admit that if you start with absolutely nothing, you will spend a bit of money to get going. But certainly don’t go buying expensive rototillers and a wide array of hand tools. I have never used a tiller in my life - dig deep once. I use a shovel. So with a garden hose, a good shovel, a trowl, and maybe a long handled hoe and hand fork, you are good to go. Many vegetables and herbs grow so quickly from seed that it makes sens to plant seed directly in the garden and save a ton of money. Especially since these same plants are often harvested then replanted two to four times in a season. See Direct Sow Seeds for a list of herbs and vegetables tha grow quickly and easily from seed. Eventually you may learn that friends and neighbors are starting seeds in late winter for their vegetable garden. Ask if you can have extra seedlings when they thin or when they plant out. Make it convenient for them by providing a few small pots and some potting soil. Instead of buying bagged manure and soil amendment mixes, save money by starting a compost heap. You don’t need to invest in a compost bin, a pile on the ground works quite well and is easy to access for stirring and turning. If you get enough goodies from your yard, gardens and kitchen the resulting compost will even be better for your plants than fertilizer. Now you just need to make some decisions about what to grow. Start simple, the next article will give you some ideas about the easiest vegetables to grow if you are not sure where to start.